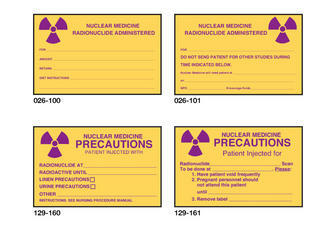 These labels are used for patients who have received gamma-emitting radionuclides. Printed in magenta ink on yellow background, labels are backed with a special adhesive for temporary adherence, without leaving a sticky residue. Copy recommended by National Council on Radiation Protection and Measurements.